You don’t have to believe in it to see results. But how does it work? 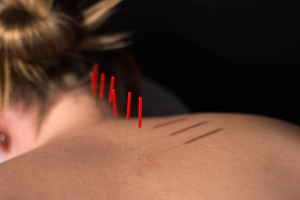 Inserting needles into muscles and connective tissue frees up the normal flow of blood, energy, and nutrients by releasing myofascial and musculoskeletal constrictions. 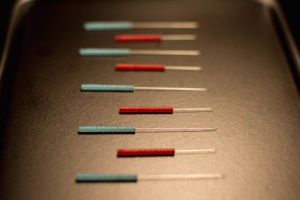 The insertion of needles also creates micro-trauma in your tissue, which induces a healing response in your body and the release of pain-relieving endorphins into your bloodstream. 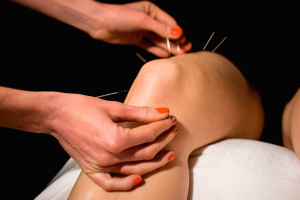 Essentially, acupuncture jump starts your body’s self-healing mechanism. Your body is constantly repairing and rebuilding itself anyway; acupuncture just makes that healing response a little more directed and efficient. In Chinese medicine, there is an ancient saying that where there is pain there is no free flow; where there is free flow there is no pain. What the old sages were getting at here is the concept of stagnation being the root of pain and disease. Over the course of a lifetime, we tend to get stuck in myriad ways: we repeatedly engage in the same habits, thought patterns, emotions, ways of sitting, standing, and exercising. Our bodies habituate to these repetitive stresses; we develop holding patterns from the strains of daily life. Athletes in particular are prone to develop these holding patterns because they often engage in the same activity for hours everyday over the course of many years. From a strictly physiological perspective, acupuncture works to release these holding patterns at three different levels: the fascial, circulatory, and nervous systems. Fascia is the webbing of connective tissue that so permeates the body as to be part of the immediate environment of every cell; it communicates three times more quickly than the nervous system, signaling mechanical vibrations throughout the body. A tug in this fascial net is communicated across the entire system like a snag in a sweater. When fascia gets stuck, it impedes blood flow and nourishment getting into–and waste products getting out of–a muscle. These tight myofascial knots and pulls in the body’s fabric are called trigger points. Acupuncture releases trigger points in as little as one treatment. This leads to a reopening of the tissue and a restoration of fluid flow, muscle function, and proprioception; it also eases the biomechanical pull that caused the imbalance in the first place. Anything that improves blood flow in the body is advantageous to health. Blood is how the body heals and nourishes itself. If we increase circulation to an area, we speed the healing process. When we create microtrauma with needles, the body activates an inflammatory response and floods the area with blood to quickly heal the tissue; it also sets off a chemical cascade that leads to the release of pain inhibiting endorphins. Acupuncture can specifically increase circulation to injured tissues and to structures with a poor blood supply like ligaments and tendons so that they heal faster. The nervous system can also develop holding patterns. Chronic pain results from nerves firing for no reason, even after the injury has healed. Pain is a fuzzy thing, and we are malleable beasts: we can experience pain where there is no tissue (phantom limb pain), and the intensity of a pain signal can depend on what other sensory information is being funneled to the spinal cord at the same time. Acupuncture can reset the brain’s proprioceptive neural threshold in order to stop the signals that lead to chronic pain; it also triggers the release of endorphins, our own endogenous pain killers. In addition, when we are chronically stressed, our nervous system can get stuck in sympathetic overdrive; acupuncture brings our parasympathetic and sympathetic nervous systems back into balance so that we are better able to rest, digest, and heal. Let's get you moving again.